iVolume calculates the volume perceived by the human ear for each song of your iTunes music collection. Thereby iVolume gets the most out of the approved Replay Gain algorithm and adjusts your songs accordingly. iVolume is the perfect companion for your Genius Mixes in iTunes. No longer adjust the volume for background music on parties. No longer dig your iPod out of your pocket just to modify the music's volume. iVolume is the perfect companion for your Genius Mixes in iTunes. ...... iVolume takes your music listening experience to a whole new level. iVolume integrates seamlessly with iTunes on Mac and PC, iPod, iPhone, iPad, Apple TV, FrontRow, and AirTunes. Most popular audio file formats like MP3, AAC/M4A, AIFF, and Apple Lossless are supported. iVolume takes advantage of newest technologies to fully utilize every core of modern multiprocessor machines for optimal performance. iVolume remembers all results ever calculated. 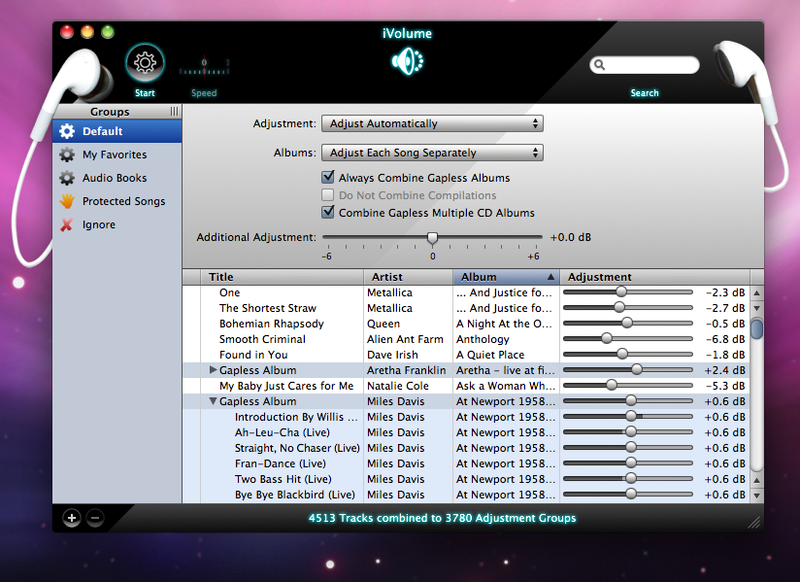 Apply changed adjustment settings without the need for re-analyzing your songs. By using a sophisticated album detection algorithm iVolume optionally adjusts albums as a whole to keep the intention of the artist. This method is particularly suitable for adjusting gapless live albums. Addresses can be printed as labels (all formats), lists or directly on Couvert. Free software for edit MAC OS property list file under Windows system. Brings the power of HTML to Windows Forms and provides fabulous text formatting. Session server for Windows has built-in fail-over protection and load balancing. Protector Plus 2008 is an antivirus software designed for Windows. WildBall is clone of Arcade game Jezzball. Qweas is providing links to iVolume for Windows 3.5 as a courtesy, and makes no representations regarding iVolume for Windows or any other applications or any information related thereto. Any questions, complaints or claims regarding this application iVolume for Windows 3.5 must be directed to the appropriate software vendor. You may click the publisher link of iVolume for Windows on the top of this page to get more details about the vendor.